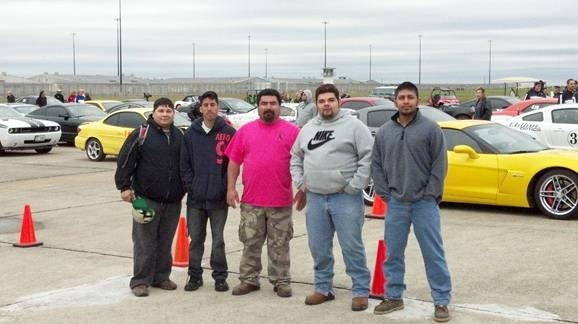 BEEVILLE, TX—Coastal Bend College automotive students participated in the Texas Mile event this past weekend by helping inspect over 100 automobiles at Chase Field. This marks the fourth time the students have helped in the twice a year event, and the experience provides them with hands-on experience on the other side of the automotive industry. Pictured above are, from left to right, CBC automotive students Jonah Puga, Timothy Barcenas, Richard Villarreal, Jose Molina, and Fidel Torres. Other students that assisted with inspections and are not pictured are CBC students Dylan Casso-Garcia, Gilbert Cruz, Jonathan Flores, and Daryn Schultz; and A.C. Jones High School dual credit students Luis Artia, Darren Blankenship, Michael De Pau, Marc Montez, Felix Rodriguez, and Mario Velasquez. For more information about CBC’s automotive program, contact Brian Anderson at (361) 354-2528 or via email at bandy@coastalbend.edu.